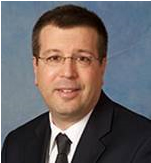 Dr. Ninia is the Director of the Department of Obstetrics and Gynecology at St. Charles Hospital in Port Jefferson , NY and a Clinical Associate Professor of OB/GYN at Stony Brook University School of Medicine. He received his medical degree from Wayne State University School of Medicine and continued his post graduate training at Nassau County Medical Center. For over 20 years, he has maintained two separate private practices in both OB/GYN and Phlebology. He has lectured internationally on the topic of women's health and venous disease and has authored 3 text book chapters and over 25 articles in peer reviewed journals. A Fellow of the American College of OB/GYN's, Surgeons and Phlebologists, he is board certified in OB/GYN as well as Phlebology and was instrumental in the creation of the nationally administered Phlebology board certification exam. He is certified by the American Registry for Diagnostic Medical Sonography as a Registered Vascular Technologist. He has served as a member of the American College of Phlebology Board of Directors and the Phlebology Foundation Board. He has served on the Catholic Health Services of Long Island Board of Trustees and helped create initiatives to improve patient safety in Labor and Delivery. His efforts resulted in St. Charles hospital earning the Healthcare Association of New York State Pinnacle Award for quality and patient safety along with his earning the prestigious Theodore Roosevelt award given to those individuals who provide outstanding voluntary contributions and leadership at Long Island hospitals. Dr. Zappert is a Clinical Professor in the Department of Psychiatry and Behavioral Sciences at the Stanford University School of Medicine. 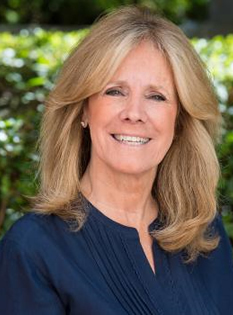 As a faculty member at the Center for Neuroscience in Women’s Health at Stanford, Dr. Zappert was instrumental in developing and directing the first Clinical Psychology Ph.D. program in Women’s Health. Previously, Dr. Zappert had served as Director of Clinical Training at Vaden Student Health Services at Stanford. Currently, she teaches a course on Sexual Violence and Recovery, and supervises the clinical work of residents in the Department of Psychiatry. In addition to her clinical, teaching and research responsibilities, Dr. Zappert has served as the Director of Stanford University's Sexual Harassment Policy Office since its inception in 1993. She also founded and led the Women’s Group Program at Stanford’s Graduate Schools of Business and Law for over 20 years. In 2001, Dr. Zappert initiated the (WISE) Women in Science and Engineering Program for women graduate and post-doctoral students in the Schools of Engineering, Science and Medicine at Stanford, and more recently, extended that program (WISSH) to graduate and post-doctoral women in Humanities and Social Sciences at Stanford. Dr. Zappert's clinical work and research has focused on the areas of women's mental health, work and wellness. She is the senior author of the 1985 landmark study “In the Pipeline”, as well as the 2002 study, “Priming the Pipeline” both of which examined the stresses confronting women in science and engineering at Stanford. Her book, Getting It Right: How Working Mother’s Successfully Take Up the Challenge of Life, Work and Family has been nationally recognized as an authoritative resource for professional women and their families. Most recently, Dr. Zappert was the senior author on an article (in press) on The Impact of a Support Group Intervention for Women in STEM. In 2017, she was awarded a Faculty Fellowship at the Clayman Institute for Gender Research. Accreditation: Continuing Education, Inc. is approved by the American Psychological Association to sponsor continuing education for psychologists. Continuing Education, Inc. maintains responsibility for this program and its content. As a Jointly Accredited Organization, Continuing Education, Inc. is approved to offer social work continuing education by the Association of Social Work Boards (ASWB) Approved Continuing Education (ACE) program. Organizations, not individual courses, are approved under this program. State and provincial regulatory boards have the final authority to determine whether an individual course may be accepted for continuing education credit. Continuing Education, Inc. maintains responsibility for this course. Social workers completing this course receive 14 Clinical continuing education credits. Does not apply to the following states/provinces: Arkansas, Colorado, Idaho, Kansas, Maine, Nebraska, New Jersey, New York, Tennessee, West Virginia, Ontario, Nunavut, Northwest Territories, Yukon Territories. Seattle, Washington - The Emerald City of the Pacific Northwest. In Seattle, stroll the bustling waterfront, visit the Space Needle, sample a local microbrew, a glass of Washington wine and world-famous coffee. Stephens Passage - Stephens Passage is a channel in the Alexander Archipelago in the southeastern region of the U.S. state of Alaska. It runs between Admiralty Island to the west and the Alaska mainland and Douglas Island to the east, and is about 170 km (105 mi) long. Juneau, the capital of Alaska, is near the north end, on Gastineau Channel. Hubbard Glacier - Marching to the beat of a different drum, Hubbard Glacier is advancing while the rest of Alaska's ice rivers are receding rapidly. In 1986, Hubbard galloped forward, closing off Russell Fjord to create an entirely new lake. The phenomenon quickly passed and was followed by a short retreat, but the glacier is once again on the move and Russell Fjord is headed for another spell as an inland body of water. Sitka, Alaska - Step back to the days of Russian Alaska as you watch lively performances of the New Archangel Dancers and view holy paintings of the Czarists' days. Ketchikan, Alaska - Immerse yourself in Tlingit Indian culture as you view the world's largest collection of totem poles; kayak the colorful waterfront. Generously proportioned and filled with light, these elegant suites include a living room, dining room, pantry with microwave, refrigerator and built-in bar, and floor-to-ceiling windows overlooking a private verandah with whirlpool. 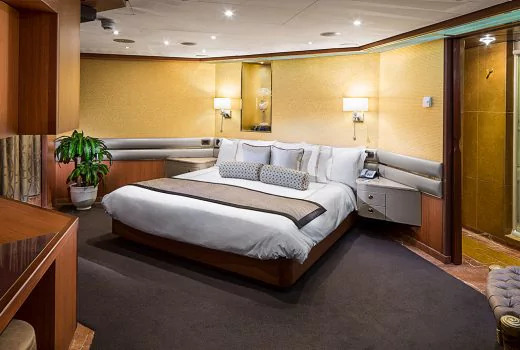 The bedroom features a king-size bed—our Signature Mariner's Dream™ bed with plush Euro-Top mattresses, and the bath includes an oversize whirlpool bath and shower as well as an additional shower stall. There's also a sofa bed, suitable for two people, and a guest toilet. Amenities include a private stereo system, use of the exclusive Neptune Lounge, private concierge and an array of complimentary services. Stateroom: 1,150 sq. ft. including verandah. These large, comfortable suites feature a spacious sitting area with floor-to-ceiling windows overlooking a private verandah, two lower beds convertible to one king-size bed—our signature Mariner's Dream™ bed with plush Euro-Top mattresses, and one murphy bed for one person. The bathroom includes a dual-sink vanity, full-size whirlpool bath and shower, and an additional shower stall. Stateroom: 372-384 sq. ft. including verandah. With floor-to-ceiling windows overlooking a private verandah, these spacious suites are flooded with light. They feature a large sitting area and two lower beds convertible to one king-size bed—our signature Mariner's Dream™ bed with plush Euro-Top mattresses. The bathroom comes with a dual-sink vanity, full-size whirlpool bath and shower, plus additional shower stall. Amenities include use of the exclusive Neptune Lounge, a private concierge and an array of complimentary services. Stateroom: 1,150 sq. ft. including verandah. 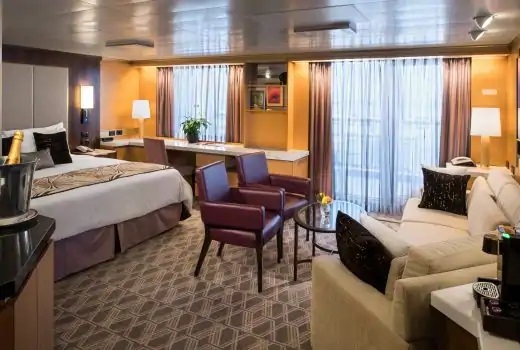 Filled with light from floor-to-ceiling windows overlooking a private verandah, these staterooms include a sitting area, two lower beds convertible to one queen-size bed—our signature Mariner's Dream™ bed with plush Euro-Top mattresses, and bath tub with premium massage showerheads. The view is partially obstructed. Stateroom: 212-359 sq. ft. including verandah. 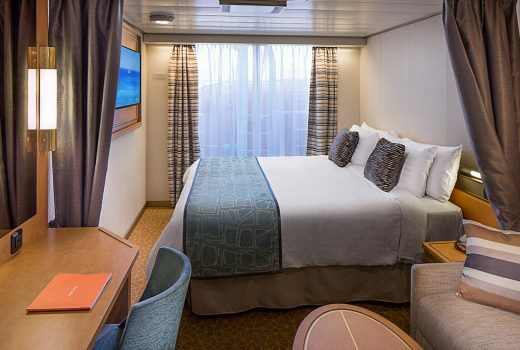 These expansive staterooms include include two lower beds convertible to one queen-size bed—our Signature Mariner's Dream™ bed with plush Euro-Top mattresses, premium massage shower heads, a host of amenities and an ocean view. The configuration of staterooms may vary from the images shown. Stateroom: 174-180 sq. ft. 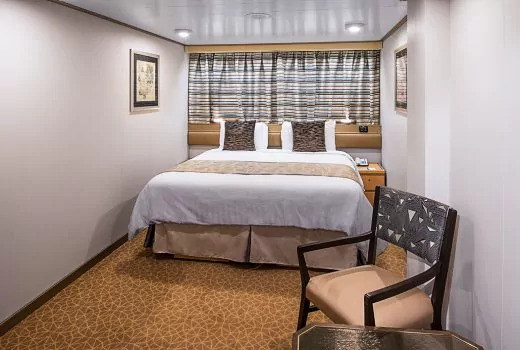 These staterooms feature a partial sea view and include two lower beds convertible to one queen-size bed—our signature Mariner's Dream™ bed with plush Euro-Top mattresses, plus premium massage shower heads and a variety of amenities. The configuration of staterooms may vary from the images shown. Stateroom: 174-180 sq. ft. 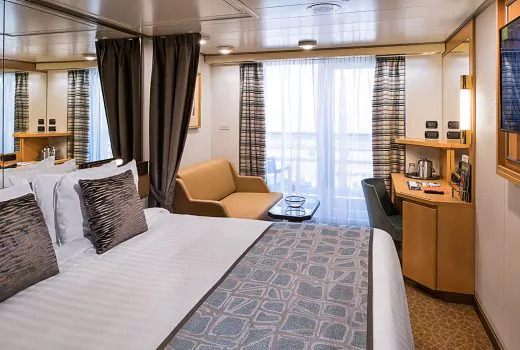 These large staterooms include two lower beds convertible to one queen-size bed—our Signature Mariner's Dream™ bed with plush Euro-Top mattresses, premium massage shower heads and a host of amenities. The view is fully obstructed. The configuration of staterooms may vary from the images shown. Stateroom: 174-180 sq. 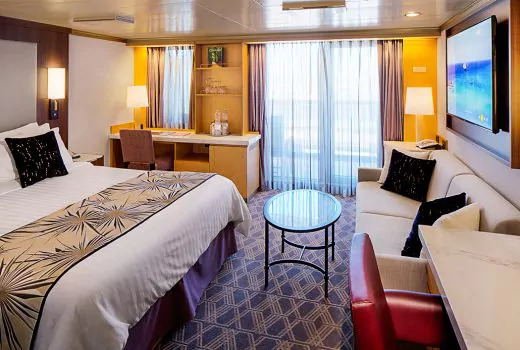 ft.
Two lower beds convertible to one queen-size bed — our signature Mariner's Dream™ bed with plush Euro-Top mattresses, premium massage shower heads and a host of amenities are featured in these comfortable staterooms. Stateroom: 151-233 sq. ft. Port Charges, Taxes & Fees $485.00 per person.